The Three Riddles ~ Riddle Stories for Kids No Reviews Posted. For Ages: 8 to 10yrs. PRINCE CALAF grew up in a castle by the Caspian Sea, in a kingdom known as Astrakhan. When he was a young man his parents died. Not long after he assumed control of the land, the kingdom was attacked by a wicked Sultan, who ruled all the land from the Persian Gulf to India. The Sultan's army was huge and brutal, and everyone in Astrakhan, including the young Prince, fled for their lives. The prince's only comfort in exile was his determination that someday he would return and reclaim his kingdom. In the meantime, young Calaf decided to seek adventure in faraway lands. So he journeyed eastward until he arrived at China, He went straightaway to its capital city, called Peking in those days, and today is known as Beijing. As he approached the castle gates, a procession approached from the distance. Leading the procession was a man whose hands were bound in chains behind him, and whose head was bowed low. "What's going on?" whispered Calaf to an old man beside him as the procession passed to a slow marching drumbeat. "Ah, to see this happen yet again!" wailed the man, dabbing his eyes with his handerchief. "What do you mean?" said Calaf, as the procession passed. "You must be a stranger," said the old man, "or you would know. Here in this city we are fortunate to be ruled by a king of exalted dignity. His daughter is no doubt the most magnificent young woman of the land, yet she has taken it upon herself never to marry, unless to someone who can answer three riddles that she poses to them. If the poor soul cannot answer her riddles correctly, he is put in chains and led to the place of execution. In this way 99 men have been taken away. And the 99th just passed before us, all of them sons of kings and other noblemen. Such a waste of young life, and for what?" "Is she really as wonderful as all that?" said Prince Calaf. "See for yourself!" said he, and he took from his pocket a small water-color portrait of the princess. It was more than beauty. Calaf sensed in the eyes of Princess Turandot something deeper, something riveting. He was seized with a feeling of confidence that if 99 other suitors had failed before him, that he would be the one to succeed. "Oh, no!" said the old man, snatching back the portrait. "Not you, too! I should have known better than to show this to you! I beg you, do not dare to approach this princess, for she has already slain fourscore and nineteen others!" But Prince Calaf was never more certain of anything. With fire in his heart, he strode to the castle door and knocked. A chamberlain wearing a golden helmet opened the door. Prince Calaf announced that he would answer the princess' three riddles. The chamberlain bid him to wait. After awhile, the chamberlain returned and led the young prince through a wide hallway to a room where an old woman sat. "I am a maidservant of the Princess Turandot," said the old woman with pride. "You must first answer two preliminary questions to see if you are worthy to appear in the royal throne room before the Emperor and the Princess and receive her three riddles. If you are not, you will be permitted to leave now and no harm will come to you. Does this meet with your satisfaction?" "Then," said she, "my lady directs you to inform her what may be the tree bearing a dozen branches, each branch covered with thirty leaves and each leaf having two colors, one half white and the other black?" He thought for a moment, then said, "Now that tree is the year, and its twelve branches are the dozen months, while the thirty leaves upon each of these are the thirty light days and the thirty dark nights." She smiled. Said she, "Inform me of the two Stationaries and the two Moveables and the two Conjoineds and the twain which are eternal Foes." He answered, saying, "The two Stationaries are Heaven and Earth and the two Moveables are the Sun and the Moon; the two Conjoineds are Night and Day and the twain which are eternal foes are Life and Death." "Very well," said the old woman. At that moment the door opened, and two pages led Prince Calaf down a wide corridor that ended at a golden double door. The door opened to a magnificent royal hall draped on all sides with shimmering rich silks from floor to ceiling. At the far end of the room was a high throne made of pure silver in the shape of a dragon, and perched on a silken cushion was the Emperor himself. "Can it be true," sighed the Emperor, "that the dust has barely settled outside from the procession and yet another suitor stands before me to seek the hand of my daughter?" "Sire," said Prince Calaf, "with all due respect I believe I can win the hand of your daughter." "Son, you are clearly of noble, perhaps royal birth," said the Emperor. "Are you fully aware that my daughter - for reasons that make sense to her alone - has stipulated that any suitor must correctly answer three riddles of her posing before she will marry? And that any man who fails..." Here the Emperor leaned forward and lowered his voice, "will be put in chains and delivered to the place of execution." "I know this," said Calaf. "I am ready." "Not so fast," said the Emperor. "This is a serious step indeed, and you must have time to consider it, whether you think you need that time or not. You will stay overnight as our guest. If you feel the same way when the sun rises tomorrow, then my daughter will pose the three riddles to you in this throne room at noon, before my mandarins and the whole court. If you change your mind, I can only applaud your good sense and you will be free to go." Prince Calaf was then led to a sumptuous guest room, where he was presented with a hearty meal and given silken pajamas in which to sleep. Yet sleep came fitfully, if at all. A thought nagged at the corners of his mind - was it right to risk everything for a princess he had never met? What about his people from Astrakhan, now scattered to parts unknown, and who counted on him to return someday and restore their homeland? By daybreak he had decided it was the right thing to do to leave. Then the sunlight cast an early morning shadow against the walls that struck a strikingly similar profile to the outline of Princess Turandot, and his whole being flooded with longing for her. The feeling, nay, the certainty that he would prevail flooded over him. In the morning a chamberlain entered and said in a loud voice, "His Imperial Majesty, the Great Khan of China, sends me to ask if you have now reflected upon your intentions and have reconsidered." Calaf responded in a clear and certain voice that he intended to stay. Servants arrived. They bathed the young prince, rubbed his body with scented ointments, and dressed him in white silk robes that were customary in the palace. They fed him a delicious meal, glancing at him, he felt, as if they felt pity for him. Finally, when the sun reached the top of the sky, the servants led Calaf down many wide corridors to the huge golden double door that opened to the emperor's throne room. The room was already full of mandarins and ministers of state, and a dense crowd of onlookers surrounded the room and were held in place by a line of armed guards. The executioner, sword in hand, stood straight and tall by the golden door. Calaf bowed before the emperor and the Khan spoke. "I must say I was disheartened to hear that you have chosen to remain. Somehow I thought you had more sense than that. Are you certain that you are willing to risk everything - and I mean everything - for my daughter, Princess Turandot?" The Emperor's eyes glanced to the side where his daughter stood, her eyes blazing. Yet in those eyes young Calaf was sure he caught a glimpse of that hidden something that had entranced him before. "Yes," said Calaf, not taking his eyes off the princess. "Then we begin," said the Emperor. "Daughter, you know what to do." "Indeed I do, father," said the princess. As she spoke the prince's heart pounded all the more, as her voice, cold and icy as it was, held within it that same glimmer of promise he had sensed from her eyes. To the heavens it makes its way. Yet of all burdens it is free. When you draw near it still will flee. Ships pass under it, yet it gains no woe. And runs as you draw near - this must be a rainbow! The princess shot a look to the chief mandarin, who arched one eyebrow. He announced to the Khan, "The young man's poetry may be lacking," and here he coughed, "but his answer is not. The rainbow is correct!" The crowd burst forth in a cheer, which was instantly silenced by the princess. And yet it graces any hand? As, like the sword's, none can withstand. It makes wounds, though no blood is shed. Robs none, yet brings prosperity. A feeling of panic raced through the young prince. It graces any hand?...its power is such none can withstand?...makes wounds though no blood is shed?...He had no idea. "If it may please the royal court, may I hear the riddle a second time?" The princess snickered. "So I thought," she said, and repeated the riddle. Few value it though it brings prosperity - why? It makes wounds yet sheds no blood - how? To say the answer must be - the plow! The chief mandarin stood to make an announcement. "We can only assume this poetry reflects the short time the young man has to craft it. Nevertheless, I must report that the second answer is - correct!" The crowd was abuzz until Turandot stamped her foot, and all were instantly silenced. "Daughter, daughter!" the Emperor rebuked her. "This is the first young man who has answered two of your riddles correctly. No one wants to see him die. You should offer him your hand right now in marriage - he deserves it!" "Father, with all due respect," said Princess Turandot, "the rule is for three riddles, and three riddles it will be. No exceptions." She stared at the young man. "No special treatment." "Very well," said her father. "Yet I am prepared to offer him special treatment of my own. Young man, what is your name?" "I prefer to keep my name to myself, if you so allow, Your Majesty," said Calaf. "Very well then, whoever you are, you have proven yourself brave and intelligent. If you resign from this test right now, I am prepared to offer you a position as imperial counselor of state. Do you accept?" "Your Majesty, indeed I am honored," said the prince. The princess' mouth opened in protest but before she could speak the prince added, "yet I decline. Our agreement was for three riddles, and three riddles it shall be." Yet it is ever fresh and bright. They reach us only by its art. Fear washed over Prince Kalaf's body. A picture fair to see...full of fire and light...all great things reach us only by its art? He couldn't remember the middle part at all. None of it made any sense. "One more time, if you please," said he. Then he asked for a third reading, which was granted. "You must have it memorized by now, clever young man," said Princess Turandot. "Now you must respond." Indeed he could repeat it by heart but what good did that do? Yet somehow he suspected the key to the riddle itself was the key to the princess' heart. Had she hidden a clue in it, or was he imagining that? What was it about her that first captured his heart? The riddle's cunning, I admit! And yet to solve it I will try. This little picture is - the eye! At these words, the chief mandarin gasped. The other mandarins cheered, and at once the crowd exploded with joy and relief. Some in the crowd fainted and needed to be carried outside for fresh air. Trumpets, drumrolls, whistles - everything was pandemonium until the emperor called: "Silence!" At once, an instant hush fell upon the crowd. The emperor stood, strode toward Prince Calaf, and embraced him. "Welcome to our family, young man, no one deserves this place more than you." "Father, wait!" called Princess Turandot. "Just one more riddle - please!" "What?" he thundered. "I have been patient. 'Stick to the rules,' you said, and I agreed. We have stuck to the rules, your rules. Three riddles was the rule, three riddles the young man has answered. You will issue no more riddles! He will have your hand in marriage, and the wedding will take place tomorrow night!" The princess rushed to her father, falling on her knees and clutching his robes. "Father, please!" she said desperately. "Your majesty, if I may speak," said Calaf, raising his hand. "Of course, young man," said the emperor. "I would have granted the princess her fourth riddle, but since you have denied it, we must all respect your royal decree. Yet may I propose a proposition of my own? I propose a riddle to the princess; if she guesses it correctly then I will remove my claim to her hand and will leave here immediately and never return, since I can see that she does not care for me. If she does not guess correctly, then the princess must swear that she will marry me freely and of her own free will." Again the crowd gasped, staring and pointing at the young man, in shock that he would keep such a matter open, especially when he had all but won the hand of the princess. "Very well," said the king. "And you, my dear. Do you swear to agree to the terms?" "I swear it!" she called out, rising from the floor. All heads turned toward the princess. "Very well," said young Calaf. "Tell me this: What is my name, and from what land do I come?" Another murmur swept across the crowd. What was the name of this young man? Did anyone know? "Very well, I will answer your riddle," said the Princess, her head held high. "Tomorrow." "Tomorrow?" roared the emperor. "This young man did not ask you to wait overnight before he answered your riddles. How dare you bend the rules at this point!" "With all due respect, your majesty," ventured the young prince, "I grant the princess her wish. She may deliver her answer tomorrow." The emperor threw his arms to the ceiling. "Very well!" Then he addressed them: "Be here at noon tomorrow and we will settle this once and for all." That night in his room the prince slept restlessly, but this time it was from excitement that soon he would marry the magnificent Princess Turandot. In his dream he heard the door knob to his room turn. Or was it a dream? He started up from bed and stared at the door. Indeed, the large door was slowly cranking open. "Announce yourself!" said the prince, reaching for his knife. "Hush!" cried a female voice. "I come to you at great peril to myself." "I am Adelma, a slave girl. My mistress is the Princess Turandot." "Come in," said the prince, climbing out of bed and straightening the covers. "What brings you here at this time of night?" "I must whisper," said she, "in this palace terrible things happen to a woman who ventures to the men's apartments. I can't stay long, but you must be warned." "Shh!" she said, somewhat frantically. "Your life is in danger. My mistress has bribed two bodyguards to stab you on the way to the throne room tomorrow." "What?!" he cried. "But why?" "She is such a proud woman she cannot stand that you answered all her riddles but that she cannot solve yours. Surely you realize she is capable of such a vile deed!" The prince's head was spinning. It's true she had sent many young men to their deaths before him, so why would he be any different? And yet...her eyes...he was sure of what he had seen...how could he have been wrong about her? "How could it be?" he cried to the ceiling, "O ruinous love! You would rather have me killed in these very halls than to become my wife? My only comfort is that my father Timurtas and my dear mother Elmazen will never know what fate befell their son Calaf, so far away in China, and how I failed to serve our people!" "Sire, quiet, please!" urged Aldelma. "I came to you now not only to warn you, but to tell you there's a way out." "I already bribed the doorkeepers and the guards at the gate. We can slip by undetected. I know all the hidden passageways and tunnels of the palace. Quick, we must escape to freedom before it's too late!" As she spoke, the princed strained to see the shadows of her eager face in the dim light, "But why do you take such a risk on my behalf and against your own mistress?" "Pschew, I care nothing for a woman who conspires such evil deeds!" cried Adelma. "From the moment I first saw you, and watched you answer her twisted riddles, and saw how generously you offered her a riddle of your own, I knew that though my mistress' heart may be cold, my own was afire with love for you. I stole away tonight to tell you all of this, and made the necessary arrangements in hope you would come away with me, so you can escape and we can make a life together." The prince looked to the ceiling. "I cannot run," he whispered. "What would the Emperor think of me? And what would Princess Turandot think?" He turned to Adelma. "Lovely lady, I'm touched by your sentiments, yet somehow I know that Princess Turandot will not betray me this way!" "Fie!" cried Adelma, jumping up. "You're prepared to die for a woman who would have you stabbed in the back rather than escape to freedom with one who loves you truly!" She choked back a tear and before the prince could say another word, she dashed from the room. For the rest of the night till dawn, the prince paced from one end of his compartment to the other. Very slowly the sky outside changed from a pitch black to a very dark blue, then to a lighter shade of blue, then to the birds' announcement of dawn. Soon a knock came on the door signaling the arrival of the servants with his breakfast. As the servants piled in with his meal, he wondered, did they know? As they fed him, bathed him and dressed him, perhaps more roughly than necessary, he wondered, is that the one? As soon as he was ready, the chamberlain came to his room, and Calaf followed him to the throne-room. The way led through great rooms, wide halls, long corridors, and past bodyguards carrying swords. As he passed them, the young man looked keenly at these motionless, stern-faced, armed men. Which of them was the murderer who, in Turandot's name, was to thrust the dagger into his heart? That man, with the long beard? This one, whose eyes glanced aside? Yet somehow, with each step, the golden double door to the throne-room came closer. Then it loomed large before him. Then it opened. Soon he stood inside the grand hall. Could it be? - he was safe! Surely he wouldn't be murdered here, in full view of the crowd that had again gathered to view the day's excitement. The Emperor spoke. "Good morning, all. Now perhaps at last we will come to an end of this trying affair -" (he frowned at his daughter). Either you, my dear daughter, know the answer to this young man's riddle, in which case he is set free, or you do not, in which case the two of you will marry forthwith." But as Prince Calaf of Azkahtran! If Prince Calaf had felt uneasy before when striding to the throne room door expecting to be stabbed at any minute, now he felt as if he had actually been stabbed. "But...how?" he could only stammer. "How?" The Princess basked in the moment. "It was a trifle to send my loyal servant Adelma to your rooms last night to worm the secret out of you. Men are far less stalwart than they think, under the right circumstances." "It was a trick!" called out one of the mandarins, who was instantly hushed by the others who looked fearfully to the Emperor. "Indeed," said the ruler, sighing. "A trick, yet apparently a successful one." Turning to the mandarins, he commanded, "Consult, all of you. Make your recommendation whether my daughter's answer was appropriately gained." The mandarins huddled together in fervent whispers. In a few minutes the chief emerged from the huddle and nervously addressed the Emperor. "It was a trick, no doubt, sire," said he. "Yet the answer is accurate. There is no rule saying such contrivances can not be used. Her answer stands, unless," and the chief mandarin quickly added, "Your Majesty feels otherwise?" "Thank you for your unbending and firm opinion," muttered the Emperor. "Very well, daughter," said he, addressing his daughter, and she smirked with satisfaction. "You need not marry this noble prince, though where you will find a better man, I have no idea. And you," he said to Prince Calaf, "are free to go." The trumpets started up and the crowd started to gather its things when the princess raised her hand. "Stop!" she cried. Immediately the music stopped and the crowd froze. "This young man may be free to go," she said, stepping toward him until she was dazzlingly close, "yet I invite him to stay. My hand is his, if he still wants to marry me." She extended her jeweled hand and he grasped it, nearly faint with confusion and joy. "When you answered my riddles, Prince Calaf, I knew that I was falling in love with you, though I couldn't let you see it. Yet I also wanted you to see that I could answer a riddle of your own. Now we are both free to choose our destinies. So I ask you, do you want me?" The crowd had never been more charged with excitement. "Princess," whispered Prince Calaf. "I want you more than ever." At that moment, the slave girl Adelma burst forth and fell on her knees before them. "I am ruined!" she cried. "Yes, I found out the truth from Prince Calaf and told my mistress about it, but I had already fallen in love with him myself! I had hoped he'd escape with me last night, or at least when my mistress rejected him this morning, but now all hope is gone! There is no more need for me to live!" And she took out a knife and held it toward her chest. "Stop!" commanded the Emperor, and Adelma turned to him. "If not for you, my daughter would not have been able to answer the riddle, and would not have felt free to offer her hand to this young man of her own free will. So I give you this reward. Rise, you are no longer a slave girl. I grant you your freedom. My courtiers will see that you leave this palace with gold and jewels aplenty to set up a new life for yourself." Adelma stood, clutching her heart with amazement and disbelief, and she stumbled out of the room while two court attendants followed her to carry out the orders of the Emperor. The Princess turned again to the Prince with love in her eyes. An instant later, however, her smile vanished. "What is it, my love?" asked he. "What dark cloud has come over you?" "Ah, that our happiness is marred by the fate of the 99 others who preceded you," she said. "What was I thinking? How could I have sent all those young men to their deaths?" "Your crime is not so unalterable as you may think," said the Emperor, stepping down from the throne. "What do you mean, father?" "I promised you that the ones who could not answer your riddles would be put in chains and delivered to the executioner," said he, "and indeed they were. But if by delivering these unfortunate young men to the executioner you think they were in fact beheaded, then I'm afraid you are surely mistaken. After they were led to the place of execution, I ordered that their chains would be removed, and they would be fed and made as comfortable as possible until you finally came to your senses." "Father, thank goodness!" the princess cried, clasping her hands together. "And now they are free men," said the Emperor. At that moment, the golden double door opened and 99 young men poured into the room, pale perhaps but as healthy as could be expected. Shouts of joy rang out throughout the throne room. The wedding was the grandest affair the city had known in some years. The entire city was decorated with lanterns and banners, pavilions and memorial archways that marked the path the prince had taken to the imperial palace. Their wedding table was decorated with gold dragons and covered with a yellow tablecloth embroidered with dragons and inlaid with jewels. It is said that over 10,000 cartloads of rice fed the wedding guests. Shortly after the wedding, Prince Calaf, holding the rank of Crown Prince of China, prevailed on the Emperor to grant him an army to reclaim his homeland of Aztrahhan from the invaders. And so Calaf led the Chinese warriors back to his homeland, where they surprised and defeated the Sultan of Carizme. The followers of the Sultan rejoiced to be freed of his wicked bonds, and welcomed their new young leader, as well as the scattered residents of Aztrakhan, who slowly returned home. Several months later, the residents of Aztrakhan welcomed their queen, Turandot, who arrived in grand style to rejoin her husband at the Sultan's magificient palace, and who held twins in her arms, the infant prince and princess. Thus the young couple ruled Aztrakhan wisely and well, and lived happily ever after. The current presentation is retold by Elaine L. Lindy. ©2006. All rights reserved. (1) A story from the book The Book of the Thousand Nights and a Night by Sir Richard Francis Burton, published 1885, and titled "The Linguist-Dame, the Duenna and the King's Son." This book, also known as 1001 Arabian Nights or simply The Arabian Nights, is a piece of Middle Eastern literature based on the frame tale of the bride Sheherezade. (2) Another story with a plot line closer to the current presentation is found in "Prince Calaf and the Princess of China" from The Persian Tales and the 1001 Days. In this version, the princess is named Tourandot. Also the character of Adelmuc (Adelma) is introduced, a slave girl who stabs herself in the end when she does not win the heart of the prince. 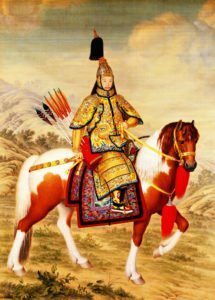 The emperor of China is Altoun-Khan, a name scholars believe to be from the Mongol dynasty that ruled northern China from about 1127-1234. (3) A story from The Travels of Marco Polo. (4) A story from Brothers Grimms' collection of German fairytales (the story "The Riddle" or "Das Raetsel", #17). In this variant the proud princess is the one to set a challenge to any suitor that she will answer any riddle within three days; if she can do this his head will be cut off but if she can not then she will marry him. In this story, the king's son is the one who poses a riddle that stumps her. Note: There are a number of other variants of the story of "Turandot." Typically, the unsuccessful suitors lose their lives. The softer ending in the current presentation of "Turandot" is a contemporary touch. The plot of the modern opera known as "Turandot" was first developed by Carlos Gozzi (1720-1806), one of the leading playwrights in Venice in the 18th century. Gozzi selected certain fables and dramatized them into realistic, domestic comedies. In 1792 he released "Turandot" with new characters and subplots. Gozzi's "Turandot" was later adapted by Geocomo Puccini in the early 1920's into an Italian opera by the same name and performed for the first time in 1926, though Puccini had died two years before and it was completed by Franco Alfano. Sidenote: Puccini may be better known to contemporary Americans by his opera "Le Boh�me," the forerunner of the Broadway blockbuster Rent, and for his 1904 release "Madama Butterfly," a tragic love story set in Japan. After some initial resistance to the production of "Turandot" in China (perhaps because of the unflattering portrayal of the fate of the men who precede Prince Calaf, whereas their heads are cut off and displayed), an epic production was staged in the Forbidden City in 1998 to popular review. The city of Astrakhan is located in Russia on the delta of the river Volga, near the Caspian Sea. In ancient times Astrakhan was Tatar capital. The Tartar people (also called Tatar) are descendants of the followers of Genghis Khan, a mixed peoples of Mongol and Turkish heritage. In 1552 Astrakhan was conquered by Russia. Modern-day Tartars live mostly in the Russian autonomous republic of Tatarstan, West Siberia, Turkmenistan, and Uzbekistan. A popular referendum in the Tartar region in March 1992 endorsed the establishment of Tatarstan as a sovereign state. In the story "The Three Riddles," Prince Calaf and the people of Astrakhan are Tatars.